The carousel site looked like this on Thursday morning. 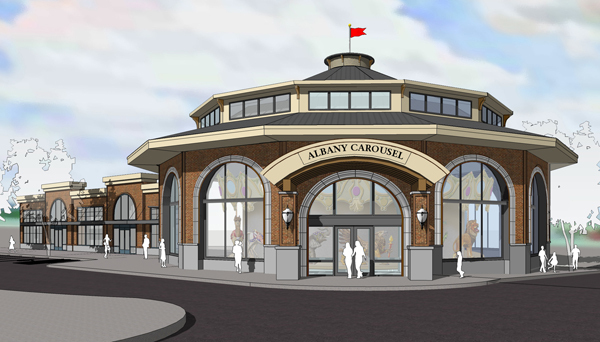 It was possible today to begin to see the outline of the new home of the Albany Carousel, and guess what — it matches the artist’s rendering that everybody has been looking at for a couple of years. As the artwork showed, the building is to have huge arched windows. And they kind of look like the steel framework now being installed. 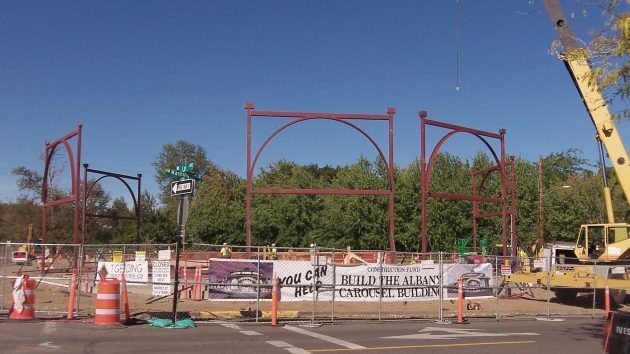 The carousel building is going up at First Avenue and Washington Street. When it’s completed, its main attraction will be the carved creatures going around on the 1909 Dentzel Carousel Corporation mechanism which the museum organization acquired and has worked to restore for about the last 10 years. Gerding Builders is the general contractor for the $5 million-plus construction project. Last I heard, the project was to be finished toward the end of 2017. So far it looks like they’re making good progress. Jim, I have to laugh – the first day that the USPS moved all of their trash cans to the parking lot and put signs on them regarding the “No Parking” was when the Cannabis event was at Monteith Park. There are now no garbage cans inside, only overflowing recycle cans.